A short scenic journey into the Byron Bay hinterland lies a tranquil and magical sanctuary. Welcome to the home of the world’s largest and most beautiful natural crystals, where you can sit in an ancient crystal cave. 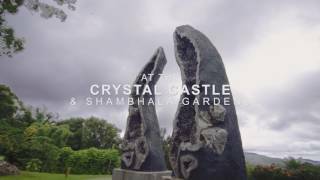 The Crystal Castle with its peaceful ambience and exquisite natural splendour is a place of wonder for everyone. Stand between two of the tallest crystals on earth, the Crystal Guardians or be immersed in the magic of the Enchanted Cave, the largest amethyst cave in the world. Walk in the lush rainforest and wander the botanical Shambhala Gardens, revealing the wonder of sacred statues and the World Peace Stupa, a project blessed by the Dalai Lama. Discover the famous Buddha Walk and walk through the towering bamboo avenue. Find yourself in the labyrinth or take flight in the Wings to Eternity mural. You can also join in daily guided experiences, including the famous Peace Experience. Enjoy breathtaking views from the terrace while you sip on fresh local coffee, enjoy a delicious lunch and homemade desserts. Only 20 minutes from Byron Bay and 40 minutes from Gold Coast airport. Discover the jewel of Byron and enrich your spirit. Child $26.00 - $26.00 Four to 14 years. Indicative Prices $26.00 - $32.00 Adult AUD 32. Concession AUD29. Child (four to 14 years) AUD26. Family (two adults and two children) AUD78. Extra child with Family ticket AUD6.